At the beginning of Spring, I always get a desire for new makeup and a brand new pair of Converse Chuck Taylor's All Stars. Originally designed in the 1920's by Chuck Taylor for basketball, (the French call them "les baskets"), these comfortable, rubber-soled shoes have become truly iconic. I love them, especially as I tend to walk from place to place all the time. 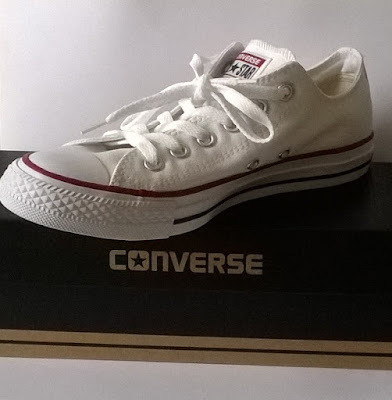 Although the leather versions are great, I do find the lighter canvas All Stars ideal for Spring and Summer - in fact I wear them all the year round. Usually, I tend to go for plain black or the combination of black with white toecaps, soles and laces, but this time I decided it was time for a change. In fashion talk, new trainers are often described as "box-fresh". Now what could be more "box-fresh" than WHITE CANVAS? Yes, I know they will be more work to keep clean and white but even so.............. 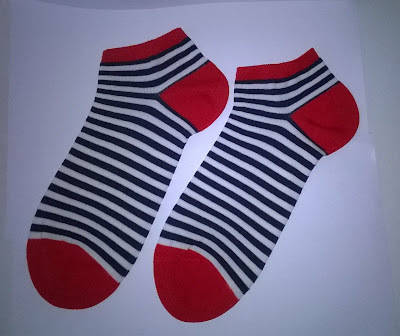 The red and navy stripes around the white soles are so chic too! As I came out of Office Shoes in Portobello Road, (one of my favourite shops), happily carrying my new pair of white All Stars Low, I thought that I should find some really special trainer socks to wear with them. I was delighted with these red, white and blue stripey socks from Calzedonia. MY KICK-START TO THE NEW SEASON!! !